There is always a lot of debate whether which file manager is the 'best' for the Linux desktop. Some would argue for Dolphin because they are KDE users, or Dolphin because it's KDE but also offers a more simplistic interface, other prefer GNOME and use Nautilus, and still, some will like Krusader because of the many features or PCManFM for it's simplicity, or Midnight Commander due to its TUI interface. So, even though you may have heard this many times before, I'm going to repeat: the best application for a specific user is the one which fits him better and helps him get the work done, in an easy fashion. However, this article is not a comparison of file managers. Today I will review Nautilus, the default file manager in the GNOME desktop environment and also in the Ubuntu distribution. The version which I'm talking about here is 2.31.92, as it currently comes in Ubuntu 10.10 Maverick Meerkat Beta, with all the updates to date. Nautilus didn't get through spectacular changes in years, at least not concerning the interface, but that's actually a good thing considering it aims to keep a pretty simple interface which can be intuitive and easily accessible even for a person who is not used to a computer. 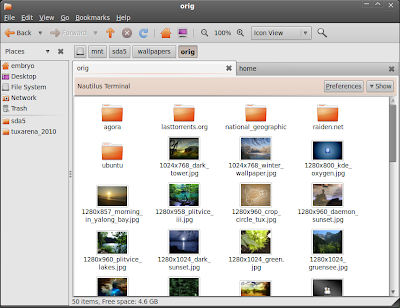 Nautilus comes with various features, including tabs (it was a long time to wait until Nautilus integrated tab support), context menu for compressing files and folders, integration with Ubuntu One allowing you to share, synchronize and publish your local files or folders, previews, bookmarks and file emblems. To the left it has a panel though which you can go fast to places like File System (root), Trash, Windows Network, but here you can also add custom locations, which will also be displayed in Open File or Save As dialogs. Regarding view modes and sorting options: Nautilus can show items as icons, list or in a compact view, can zoom in and out, and it can sort by name, size, type, modification date and even emblems (you can set this in the Preferences). The Preferences module allows you to set the sorting rule, show or hide hidden files, change the default zoom level, set single or double click to open files or folders, change how previews work, handle media and show hide attributes used by the view list mode. Nautilus has been here for years, and it will surely continue to do so. It fits perfectly in GNOME and provides the user with enough features to get the work done. 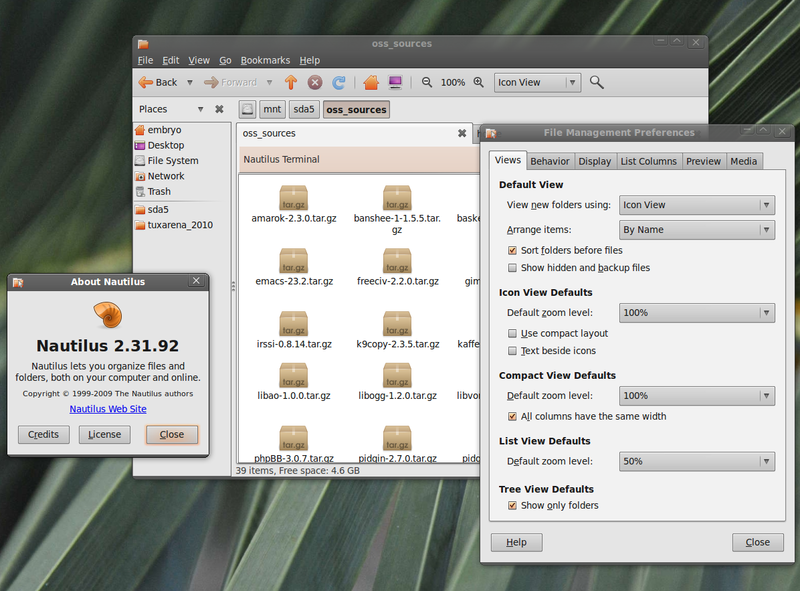 i removed the ubuntu one stuff from nautilus right when i found them. i don't want it, and it's a huge waste of space. same goes for the nautilus terminal, it takes up too much space. i would use it if it just added a button to the toolbar, but not with that huge bar. A great alternative (not precisely an alternative and more of improved version of nautilus) is nautilus-elementary . Why is it better? I didn't see a mention of extra pane, which I found to be wonderful for moving files .There is even a right click option for copy to other pane. Sweet. It would be nice to be integrated to main nautilus with Gloobus Preview. One thing never change. Delete file in another partition not /home or ntfs partition, the file is gone not goes to trash.